Helene’s research concerns the patterns, causes, and consequences of plant diversity. The patterns of interest include the diversity of ways in which plant species make a living, plant species coexistence within the same area, and the diversity of plant communities around the globe. In terms of causes, Helene examines proximate correlates such as climatic factors and functional traits as well as the ultimate causes deriving from selective forces, physiological constraints, and underlying tradeoffs. The consequences that interest her most at this time are those concerning carbon pools and fluxes – specifically, how the plant species composition of a forest affects the quantity of carbon stored in various pools (e.g., living trees, dead and decomposing trees, and the soil), the residence times in these pools, the fluxes in and out of them, and their sensitivity to climate variation. She uses a combination of empirical and theoretical approaches to investigate these questions. As lead scientist of the ForestGEO Global Carbon Program, Helene strives to implement standardized measurements of forest carbon stocks and fluxes across this network of forest research sites, assist network collaborators with associated analyses and manuscripts, and contribute to related syntheses. Helene's lab is also quantifying landscape-scale variation in forest canopy structure and dynamics in Panama using camera-carrying unmanned aerial vehicles and photogrammetry. 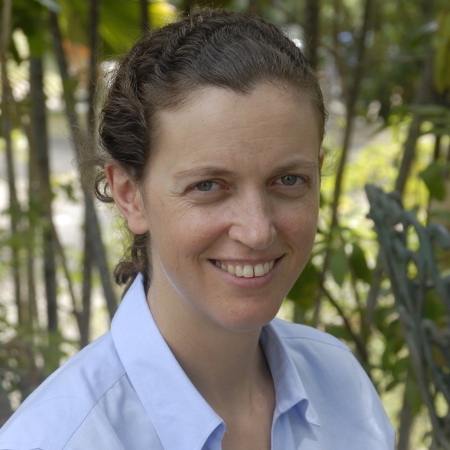 Helene is based at the Smithsonian Tropical Research Institute (STRI) in Panama and you can find her Bio here.